Nail A College Drop Out: Reciprocal Or Double Gradient? Press Sample I've been seeing reciprocal gradients all over my Tumblr and Instgram feeds so I finally decided to give one a whirl! Only I'm not quite sure it can be considered reciprocal if I use two completely different sets of colors. I started with a base gradient of Priti NYC City Girl Rose and Priti Hedge Hog Rose. To speed up the drying process a added a layer of Dazzle Dry Top Coat. Then, I laid down some striping tape and made a gradient of Priti NYC Baby Blue Eyes and Priti NYC Scotch Thistle. After I felt the color built up to a nice opacity, I removed the tape and added an additional layer of top coat. 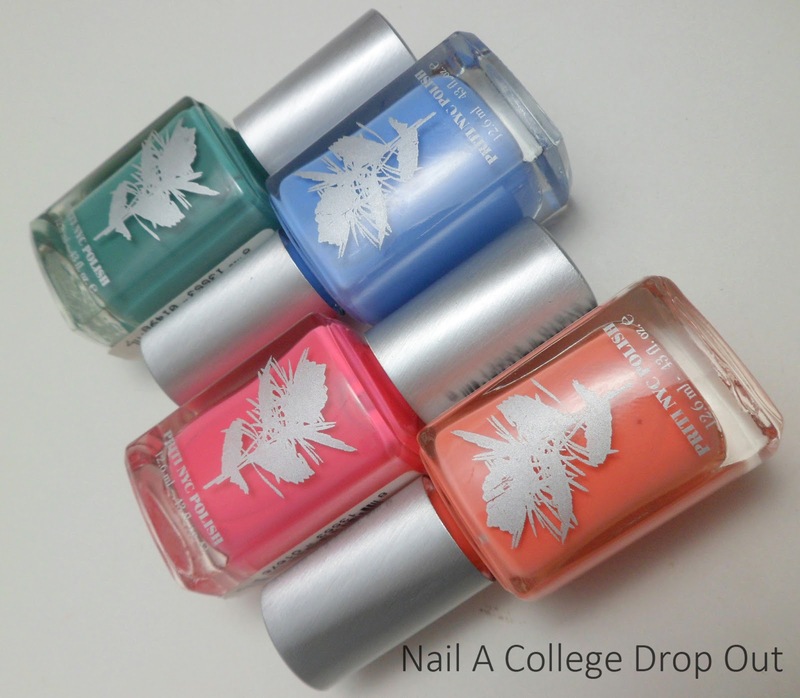 My favorite nail polish finish is creme so I was intrigued by this collection at first sight. Other than that, my immediate impression was that I would like Scotch Thistle the most. Don't get me wrong, Scotch Thistle is great. But, City Girl Rose is such a vibrant mid-orange creme. Before I forget, Baby Blue Eyes has a super slight shimmer. It is barely noticeable but it is there. All of these shades are part of the Priti NYC Bahamas Summer Kit currently on sale for $35.99 on PritiNYC.com. This is gorgeous! Such a great collection from Priti. WOW THIS IS OUTSTANDING! I love this collection, and this looks amazing! That is lovely, what a fabulous contrast of colours! Awww...this is so cute! I super love the color combos and the way you play with these colors. Great job!